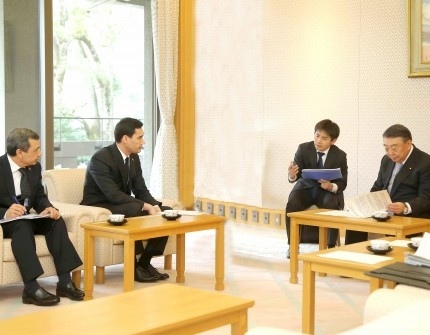 AKIPRESS.COM - Delegation of Turkmenistan led by the Chairman of the Turkmen-Japanese group of inter-parliamentary friendship of the Mejlis of Turkmenistan, Deputy hyakim of the Akhal province Serdar Berdimuhamedov began their trip to Japan, Turkmen foreign ministry said. Delegation of Turkmenistan had a meeting with the Speaker of the House of Representatives of Japan, Mr. Oshima Tadamori, on March 25 to discuss political, diplomatic, economic, cultural and humanitarian cooperation. Turkmen delegation visited the Museum "Miraikan-the world of the future in Odaiba island. Members of the Turkmen delegation learned about modern advanced scientific achievements of Japanese scientists. In addition, the delegation of Turkmenistan visited the center for water treatment “Аriake Water Reclamation”.